Despite living amid the Greatest Snow on Earth, some Utahns still dread winter and its months of cold, smoggy stagnation. Maybe skidding down a frozen mountain between rocks isn’t your idea of fun. Maybe your knees have been ground into pulp from too much of said fun, or maybe you’re just bored waiting for the next righteous Wasatch dump. Either way, here are a few suggestions for each month of the 2013-14 ski season so your cabin fever doesn’t blossom into a rash of cannibalism. If you’re tweaking for a shred fix and didn’t spring for a season pass, a few resorts typically offer discounted lift tickets for less than $50 during November, though you’ll most likely be carving up the manmade “ribbon of death” until more snow falls. Early November is also prime time for ski swaps, like the Park City Ski & Snowboard Swap on Nov. 8, 9 and 10 (ParkCitySkiSwap.com), where you can trade or sell your skis, boards and accessories for new and used gear. And if you’re totally repulsed by the thought of snow, the weather usually permits a weekend trip south for red-rock camping or slick-rock mountain biking. If this December is anything like last year’s, we’ll have a decent blanket of snow in the city. All that white stuff provides opportunities for cheap recreation that can satisfy the snow-loving inner children we’ve buried in an avalanche of responsibilities. Cross-country skiing in Sugar House Park after a big storm is an easy way to boost your heart rate while viewing the city from a more peaceful perspective. Try Mountain Dell in Parley’s Canyon if the park is bare. If you’re not into the skinny-ski scene, a snowy snowshoe hike along the Shoreline Trail, Ensign Peak or The Willows in Big Cottonwood Canyon can also inject fresh air into your stuffy winter lifestyle. Sports Den rents cross-country setups and snowshoes for less than $10. If that’s too pricey, commandeer a lunch tray and join the sledding circus on Sugar House Park’s competitive sledding hills. January is national Learn to Ski & Snowboard Month, and most Utah resorts offer deals to get fresh meat onto the snow. In 2012, Snowbasin offered the Lucky 13 deal for first-timers, which featured a beginner lift ticket, a two-hour group lesson and basic equipment rental for $39. Four- and five-day packages are also available at Alta and Park City Mountain Resort for around $200. Even if you already know how to shred, January is still prime time to learn new alpine skills. Avalanche-safety courses at the University of Utah (Continue.Utah.edu) or Utah Mountain Adventures (UtahMountainAdventures.com) give you a knowledge base for exploring the untouched terrain of the Wasatch. 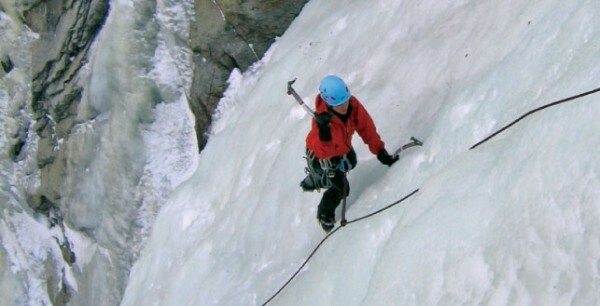 To tickle your rad bone, schedule an ice-climbing clinic with Utah Mountain Adventures, which are available to all skill levels for $180 per person. For confident climbers, UMA offers multi-pitch climbs and private guided trips up the Great White Icicle in Little Cottonwood Canyon and Bridal Veil Falls in Provo Canyon. February is that magical month when you’re supposed to buy rare jewels and chocolates for your lover(s). Save some cash this year and book a romantic sleigh ride complete with a rustic dinner. Snowed Inn Sleigh Company (SnowedInnSleigh.com) in Park City offers 25-minute rides to its lodge, where they serve dinner with live music for $79 per person. You can also experience a snowshoe-in five-course meal at Solitude’s on-mountain Yurt (801-536-5709, SkiSolitude.com). For the cash-strapped, Diamond Fork Hot Springs in Spanish Fork Canyon is a wilderness hot spring perfect for lovers willing to hike or snowshoe a few miles in the snow. If the gate is locked, the hike could be up to eight miles long, but that almost guarantees a private hot pool for uninhibited intimacy between you and your pink-cheeked valentine. As the days warm up in March, Utah resorts host concerts and festivals to celebrate another profitable ski season. The most popular is the Canyons Resort Spring GrÃ¼v, which kicks off every year with pond-skimming and costume contests. Basically, whoever can skim across a 100-foot pond while dressed up in a chicken suit wins a prize, with the most creative costumes getting additional prizes. Almost anything goes, including lighting yourself on fire before crashing into the pond. The Spring GrÃ¼v also starts the free concerts at the Canyons Resort Village, which are walk-up friendly. Park City Mountain Resort and Snowbird also host spring concerts, adding a festival atmosphere to the longer days. If you’re itching for a change of pace, Lofty Peaks Adventures (LoftyPeaks.com) offers guided snowmobile trips around the Wasatch Back. And the deep snowpack and warm sun make March the best time of year to get out on a sled and let loose your need for speed. The absolute best ski days are in April: The snowpack is deep, the days are long, the storms drop a few feet of powder at a time and the tailgate atmosphere is second only to football season. Plus, you can opt out of skiing altogether and hike the lower trails that have already dried out. Snowbird offers spring passes so that you can get in sunny powder days; prices get lower as the season progresses, and in April they’ll be about $275. In addition to great skiing, April is also time for closing-day parties at each resort. Alta’s party on top of High Boy could be the Wasatch’s best. Once you consume your backpack full of beverages, you have no choice but to ski straight down High Boy’s bumps while dodging snowballs. If you can’t make it up to High Boy, the Neff Beach Bash at Brighton is a solid party with a snowboard comp, DJs and a few hundred locals hucking their meat in a hilarious last hurrah of the season. The mountain shenanigans usually end just in time for National Park Week (the last week of April, NPS.gov), when admission to all national parks is free. There is no better way to cap the season and welcome summer than by exploring Utah’s red-rock treasures and sleeping in the sand, especially when it’s free. Stock up on the basics, prepare for emergencies and indulge in a new gizmo or two.